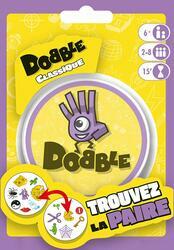 Dobble is a game of observation and speed in which all players play at the same time. 55 cards each with 8 symbols, 5 variants... and off we go! Whatever game you choose, find the one and only identical symbol between two cards faster than your opponents and name it aloud. Then, retrieve the card with the same symbol as yours, discard your card or give it to an opponent, depending on the rules of the variant you are playing. Contents of the box : 55 cards, 5 rule cards.